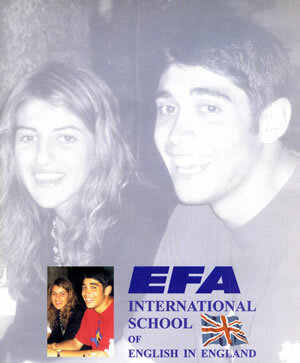 Welcome to the EFA History page. You don’t want to read too much, so I’ll keep it short! The school started in 1973 with the first ever junior group from Austria, going to Bognor Regis. A small office was opened at No 1 Market Street in Worthing. 1974 and 5 saw a steady growth with students from other countries, and summer centres were established in Bognor Regis, Worthing and Brighton. In Autumn 1976, the first full time students started in Worthing. In 1987, the school moved to larger premises at 58 Chapel Road, Worthing, where it stayed and grew steadilly, mostly with students from Switzerland and Iran in those days. The biggest achievement for us at that time was getting recognised by The British Council and then joining ARELS, the Association of Recognised English Language Schools. In 1981, EFA aquired Seadown House in Farncombe Road, Worthing and in 1987, it aquired the second building called Woodstock, also in Farncombe Road, which gave extra classrooms and other facilities. Meanwhile, the summer schools were still flourishing. We bought a minibus – does anyone remember the yellow bus? Swiss students thought it was a vehicle for mentally handicapped people! Over the years, we worked hard, built up a good reputation, did a lot of active marketing, enjoyed ourselves, had regular and riotous parties (what fun! ), held reunion parties in Switzerland and kept in contact with ex students from all over the world, from Brazil to Japan. Around 1995, UK state colleges started courses in English for foreigners and our local colleges, Worthing Sixth Form and Northbrook were in competition with us. It became more difficult to attract students when these colleges could offer cheaper or sometimes free courses. The Swiss market dropped because banks and hotel schools no longer demanded the Cambridge First Certificate – the exam we offered and managed to gain so many passes for our students. I was tired and decided to sell. I started the school from nothing and worked in it continuously as Principal for 27 years. The school was bought in December 1999 by a former teacher and his wife. Unfortunately, the new owners changed the name from EFA to SELS (I never understood this) and also decided not to use agents. I had worked so hard to build up a network of agents worldwide over the years and all this was wasted. It continued at Seadown House for 4 more years before it moved to new premises, then, sadly after one further year, it ceased trading.